I'm a townie by nature I suppose. Apart from the first three years of my life, I have always lived in towns and cities. Occasionally while out cycling I will pass through a village and think to myself ooh, this is nice, I could live here. But, as my wife needs often to remind me, the novelty of living in the countryside would probably wear off after the first eighteen hours or so. And in any case, the Suffolk countryside is today being bled to death. Post Offices, shops and pubs close, house prices outstrip the means of locals, dairy farms succumb to housing land profiteers, children are bused to school in the nearest town, and the jobs on the land evaporate as the big supermarkets squeeze the life out of rural England. Once, not so long ago, we weren't just consumers. We used to make things, not just in big factories in the cities, but in small workshops in villages. And we used to buy and sell our local produce in our villages rather than driving weekly to a massive Tesco store ten miles away. We had a sense of community and interdependence. Now, we have broadband: while her husband is something in the City, a London designer can sequester herself in her remote Suffolk second home and conference-call her clients in the States, while her children downstairs are groomed by dangerous strangers in chatrooms and on Facebook without ever meeting any of the local kids. Outside, the land owned by her husband's pension fund is rapaciously double-cropped by land agents using cheap migrant labour. The East Anglian countryside that I knew only thirty years ago has gone forever. But there are still surviving communities in this holocaust, settlements with shops and pubs around a wide village green, where the lady in the post office still calls you dear and passes the time of day with you, even though there is a queue behind; villages where there is a café and a petrol pump and even a secondhand bookshop, and such a place is Westleton. It is my favourite village in all East Anglia, and if I am ever seized with the mad impulse to get away from the hectic dynamism of central Ipswich and head off to settle, and eventually to die, in quiet rural retirement, it would be Westleton to which I would choose to come. While I have always been very fond of this village, I am especially fond of its church. Back in 1990, it was the first Suffolk village church which I properly explored, and I enjoyed finding my name from then in the visitors book. The wide open churchyard and towerless church are hidden from the village street by a high hedge, and it would be perfectly possible to pass through Westleton without even noticing St Peter. Once on the path that rises from the east, though, you find yourself in a beautifully atmospheric churchyard, with more than its fair share of interesting headstones. 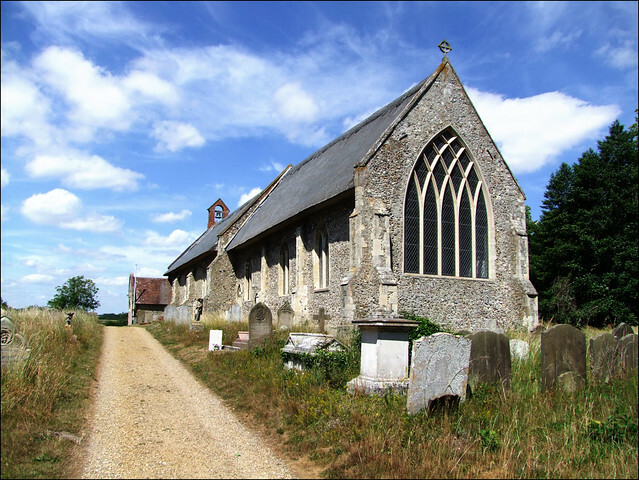 Several of them provided the basis for stories in Ronald Fletcher's In a Country Churchyard, recommended reading for all fans of Suffolk churches. Among the graves that Fletcher noticed is one for June Perry, a man, who was 'warrener' for the royal family at Windsor from George III to Queen Victoria. The church appears long on its rise, the fine interlocking Y-tracery of the east window like a spray of flowers. At the west end is a curious buttress: the tower fell in 1776, and the stubby replacement fell victim to a World War II bomb. Its remains were demolished in the 1950s, but the little red-brick turret is perfectly in keeping, and contains a bell from the 1960s. All in all, it appears an undistinguished exterior. However, on stepping inside, the first impression is one of surprise and delight. This is a cool, open, large interior. White light falls across brick flooring and low doored pews. It is enchanting. The Victorians were busy at Westleton, but what could so easily have ended up as an anonymous, urban restoration has left us instead a deliciously rustic touchstone to our 19th Century forebears. The blacksmiths and ploughboys of Victorian Westleton would still recognise their church. It is true that not much that is ancient has survived, but the church has a good set of 14th Century piscina and sedilia in the chancel. Again, the feeling is of a quiet, unchanging simplicity rather than grandeur. There is another piscina in the south wall of the nave, and at the west end the font seems to be from the same workshop as neighbouring Darsham and Middleton. The 19th Century benches are a curiosity. They are not box pews, and have the customary Victorian medieval-style poppyheads, but they also retain doors numbered in gothic scripted Roman numerals. They appear to date from the church's 1857 restoration, but I haven't seen anything quite like them elsewhere in Suffolk. To the east of the north range is a grand prayer desk which Mortlock dated to the 1930s and thought the work of a local Captain Jackson - the finials depict a sower sowing and a fisherman drawing in his nets. The nave is under a long barrel-vaulted ceiling, incidentally the same as the chancel at neighbouring Darsham. The 1940s windows in the chancel are notable because they are the only Suffolk work of Edward Woore. That on the south side depicts St Felix and St George, and beneath St Felix's feet is a panel depicting the tools of a Suffolk farmworker half a century ago: a sickle, a plough, a fishing rod, a shotgun and what I think must be a wickerwork ferreting basket. All Thy Works Shall Praise Thee O Lord says the line above from the psalm: but how many of those works praise the Lord in Suffolk today?